We are leading service provider of Dredging Support Services. We Our team of trained people renders comprehensive support services for dredging operations. 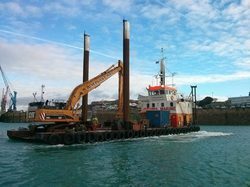 Pre and post-dredging surveys and positioning during dredging operations. Quantity calculation of dredging material and sediment transport. Feasibility study for maintenance dredging pattern.